I think one of the reasons why I was so hesitant for so long to publish Sunday’s post was the vexed and debated issue of triggers; the question of whether recognition of triggers panders to an over-sensitive community, or if ignoring triggers is insensitive and a gross display of privilege. So, here in No Kidding land, it is worth questioning whether the idea of avoiding the things that hurt us (scan photos, baby showers etc) is healthy, and will it, in the end, hurt us further by isolating us from the wider, largely parented, society. In the beginning, when we first confront the permanency of our No Kidding lives (or begin to confront this whilst still actively trying to become parents), many things will hurt us, whether they are thoughtless comments or pictures on a blog or on Facebook, or more largely, the feeling of isolation from mainstream society. Self-preservation and self-protection is necessary at this stage, and displays of sensitivity from others is much appreciated. We all know we can’t make the world conform to our desires, but that doesn’t mean we can’t speak up and try to change it for the better. I have to admit that I have had this post largely written for over a year, but for reasons that will become obvious, I’ve been a little scared to post it. Bent Not Broken’s post about being ambushed by a work colleague with a scan video has finally prompted me to hit the big orange button, Publish. These days, in my happily ever after No Kidding life, I don’t have many triggers. I can watch birth scenes on TV (I’ve always been curious about the act and process of giving birth), and breastfeeding (even though that was a particular loss I felt) with little or no discomfort. But scan pictures can still throw me off kilter. My only scans have been to diagnose (or attempt to diagnose) my ectopic pregnancies, to see the seemingly endless (at the time) problems in resolving my second ectopic pregnancy, to show that IVF wasn’t working for me, and to diagnose my fibroids that lead to my hysterectomy. None of these resulted in good news, or happy memories. So I flinch whenever I see one. I of course admit I have been scarred by my history. I’ve recounted before my story of emailing good friends offshore to tell them of my second ectopic. They didn't know about my first either, but I updated them at the same time – I was responding to their Christmas/New Year message (how joyous). I received an almost immediate response. It said, "sorry to hear that, but hey, we're pregnant, and attached is our scan photo!" Needless to say, I deleted the email, and never opened the attached photo. This couple had struggled themselves with infertility, requiring IVF/ICSI to conceive, so I could understand their excitement. But as we know, infertility doesn’t necessarily breed sensitivity either. It’s the same in the ALI blogosphere. Now, before I offend anyone, I’m the first one to support those who are pregnant or parenting after infertility in writing about their realities. Once it is clear they are pregnant or parenting, I don’t believe they should have to put disclaimers, or particularly censor their words. If they’re finding pregnancy or parenting hard, then they should feel free to say so. If they are joyously happy, then they can say that too. We have the choice of reading their posts – usually you can see the direction a post is heading, and choose whether to continue – or not. Self-protection for us is relatively easy. Pictures, however, are different from text, or spoken words in a podcast, and research shows they are far more likely to elicit negative emotions. And the issue is wider than just scan photos, but these are most commonly posted. If there is a lead-in to a post that suggests I might not want to scroll down to a visual image, or simply refers to coming images, or is hinted at in the post title, or has a photo one click away, then I very much appreciate the warning. I can then choose not to click , or simply to look away, or even just mentally brace myself. But if a photo (scan photo, for example, or birth/baby photo, or breastfeeding photo, or photo of a positive pregnancy test - or whatever might be a trigger) is the first thing we see when we open a post or see a Fb update, then there is no option but to see it. In a split second, unlike with text, we have seen the full image, and will experience all the emotions that surround that. Likewise, in real life if we are asked if we’d like to see baby photos or scan photos or video, or whatever, we can see what’s coming, mostly, and choose to avoid it. But where people want it to be a surprise (like BNB’s colleague), we have no choice, no ability to protect ourselves, and we’re hit when we’re least expecting it. Now, I do understand that a finally pregnant IVFer might be thrilled to have a good news pregnancy test/scan/birth/breastfeeding experience at last, and may want to share that with their readers. It’s become a rite of passage that some people have desperately wanted to experience. I think many of us can relate to that. But I have to ask, is a photo of an ultrasound scan (for example) – especially on what, until the scan photo is posted, used to be an infertility blog - really necessary? I don’t really understand why people want to share their scan photos anyway – especially if we already know they’re pregnant. I'm pretty sure I wouldn't have shared mine. After all, they don’t impart any extra knowledge – unlike birth photos, where you can see the baby, learn if they have red hair (like my adorable niece), or if they’ve got long limbs (like my sister), or dimples, and start to get to know the new little human. Scan photos though, all look exactly the same (with the exception of scans for multiples), so sharing them online with others seems unnecessary. Wait. I acknowledge that they are of course completely necessary and important for the parents-to-be, but probably only the parents-to-be or okay, maybe the grandparents-to-be too. But for the rest of us, they’re pretty irrelevant, perhaps even incomprehensible. After all, it’s not as if we require proof of their claim that they’re pregnant! We can still be happy for them or to offer our congratulations. I know that someone who hasn't experienced infertility might not really understand that sharing such images (or the way they share them) can be painful, and I can choose to educate them (or not), depending on who they are and the relationship I have with them. It is much easier to do that these days. But that’s the thing I don’t understand here in the ALI blogging community. People who are pregnant after infertility know, for example, that scan photos can be painful. They know how it feels to be side-swiped by suddenly coming across an unexpected photo. Or even if it doesn’t affect them, they know that it can and does affect others. We all wish we didn’t know that, that there was no reason to know that. But surely a cost – and I would argue, a benefit – to infertility is that it can bring greater awareness and compassion into our lives, especially when we consider how our actions will affect others. Yet despite that, some still choose to post scan photos, arguing that they have wanted to be able to do this for so long, they should be able to. That’s a fair enough argument. I agree, it isn’t fair that some women and couples can, without guilt or thought, spread their happy news this way, and that it is harder for the infertile. But, knowing what we know, do we really want to be those women? Can we, after experiencing so much, really be those carefree people? We all know former infertiles who seem to suffer from infertility amnesia, treating current infertiles and those of us without children in ways that would have appalled them even weeks/months earlier, when they were going through infertility themselves. I find it hard to believe that they truly forget, that there is never a wee pang of guilt as they join the insensitive parent/pregnant person club. It's a choice. And it isn't as if that is the only choice, either. There is a thoughtful parent/pregnant person club, and - although it is unfortunately smaller - you don’t have to have experienced infertility to be a member. So what I find hard to accept is that some of our fellow bloggers then consciously choose their own wishes over the pain of the people they know will be reading their posts. It’s not done through ignorance, but rather is a decision not to care. Does this mean I hold those who’ve been through infertility to a higher standard? Yes, it does. And I guess that's why I'm writing this here. Because I like to think that when we know better, we do better. 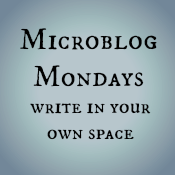 I’ve been trying to write a Microblog Mondays post for about an hour now. I’ve been reading a lot of the draft topics I have in my No Kidding Blog document, I’ve added to and edited a longer post that is almost ready to go (prompted by a recent blog I read elsewhere), I’ve read some articles, and I’ve started drafting and discarding several posts. There’s only so much I can say in an eight sentence post. (Yes, I have stuck diligently to the original suggestion that these posts should be no longer than eight sentences.) I don’t want to briefly address a topic that deserves more attention, and I don’t want to repeat myself, as I know I probably do too much anyway. So today, as inspiration has failed me, I need to accept – as I have had to do in the past –that sometimes, it is just not going to happen. That recognition is once again liberating, and allows me to feel happy at the good day, and at the other task I’ve been focused on lately, and that is planning travel activities somewhere exotic. Instead, I need to go outside and enjoy this (rare) lovely day, appreciate that I’m not busy doing a school run or dashing from work to school to after-school activities to a chaotic home, and breathe deeply. Saying “it gets better” may at times feel meaningless to a grieving childless person, because it is so vague, not specifying how, or when, it will happen. So I’m going to try to articulate something that I realised today, after reading two different blog posts about spending time with children. When we’re infertile, and going through the initial grief of childlessness, every child and every pregnant belly we see are reminders of the children we wanted, the children we have lost, the children we will never have, and the parents we will never be. They feel so close, such an intimately painful part of us that has been wrenched away, that having them around us is at times unbearable. We’re acutely aware they are not our children, the children we wanted, but yet … in ways … all children are the children we wanted, our children. As we heal, I think we manage to put a distance between ourselves and our wounded hearts, and other people’s children, recognising that there’s a difference between the children we wanted to have, and the children who are there in front of us. That separation in my heart and my mind certainly got easier over time, as children who were babies at the time we were pregnant (or trying to get pregnant) grew and developed their own unique personalities and bodies that didn’t and couldn’t have come from us, even in our imaginations. These children are not the precious, unformed beings we had hoped to have and had already loved with all our hearts, but I now see that this is a good thing, as it gives me a freedom to love and appreciate these children for who they are, untainted by my ideas of who I wanted them to be, and without the awful yearning for them as my children. I could feel her pain, and her unwillingness to freely admit, without qualification, that life without children has many advantages. It’s that feeling we have, so many of us (all of us?) that if we admit that we enjoy life (or at least many aspects of our life) without children, maybe what we’re really saying is that we didn’t want children enough or worse, that we didn’t deserve children enough. It’s as if we feel we are admitting something that is a betrayal, that is heretic, almost sinful; something that is certainly anathema to the prevailing belief elsewhere in the ALI blogging community, and in wider society, that parenthood is everything. I will admit, from time to time I still experience a flicker of guilt, of a “what if this means I didn’t want them enough?” thought that appears to torment me. But now I am soon able to despatch that thought, knowing that the thought is in itself a betrayal, heresy to my staunch belief that we can truly enjoy our lives without children, even though at one stage we genuinely and deeply wanted to have them. This way of thinking is a betrayal of of the decisions I made and the decisions and situation that were forced on us, of the pain I’ve been through to get where I am, and of the babies we lost on the way, and mostly it is a betrayal of me, my life now, and my life with my husband, my family and my friends. On the bright side, I think that we all work through this stage eventually – or I sincerely hope so – and even though the negative thoughts may come, I know now that we can choose to listen to them and let them linger, or shoo them off with a confident, and knowing, flourish.